Kathleen Ryan was an actress who had a successful Hollywood career. 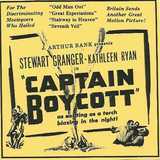 Ryan began her career with a role in "Captain Boycott" (1947). Ryan began to focus on film after appearing in the James Mason drama "Odd Man Out" (1947) and "The Sound of Fury" (1950). Later in her career, Ryan acted in the adventure "Captain Lightfoot" (1955) with Rock Hudson. Ryan passed away in December 1985 at the age of 63.